Not all the tales that were spun around the potbelly stove were “tales”. Some (like the one I am about to relate about Andrew Boggs, Jr.) actually contained a pretty good portion of fact ....with just a pinch of embellishment to add a little spice. Everyone in our neck of the woods had heard of Andrew Boggs, who was born on November 29, 1815. He was a legend! My grandfather Smith and Uncle Cooper Smith, both born in the 1870’s, were about as close to knowing him as anyone around, and both knew stories about Andrew Boggs and his strength. Now getting back to my original tale, one evening around six o’clock, the store was full of warmth from the potbelly stove and some men sitting around, who were filling their pipes or cutting a fresh plug of tobacco. They began talking about how the folks now-a-days are just not like the way old folks used to be. I remember wondering what exactly that meant…now I know. Anyway, someone brought up Andrew Boggs’s name and the conversation sort of revved up. That brought on some shuffling of feet and a couple of comments about how in the world a man could ever lift a mule. As was usually the case, another story followed about Andrew and some fellow (name unknown) who were arguing about which one was the strongest. The fellow finally suggested, with some authority, that they should just fight to see which one was the strongest. So Andrew took off his shop apron and followed his challenger outside behind the gunsmith’s shop for the contest. There were of a lot of small saplings and brush growing around the place and both men complained there was not enough room to have a good fight. So they started clearing a space by pulling the saplings up by the root. As the story goes, some of the saplings were as big as your arm, and Andrew was pulling them up two at a time - with each arm…finally the fellow conceded and declared Andrew to be the strongest man in them parts. 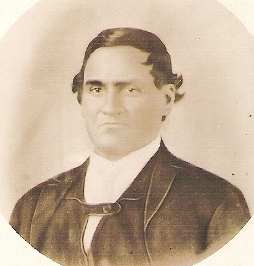 Andrew Boggs, Jr, was born November 29 1815, and married Mary Lake in 1839 and together they reared seven sons and daughters. Andrew and his brother were gunsmiths. Andy, Jr., could make the closest shooting guns of his day; they had the percussion lock and shot a patched ball. These guns were hand made (meaning lock, stock and barrel) and widely known as the American squirrel rifle. These muzzle-loading rifles were said to be the most accurate shooting guns in the world. Sportsmen who possessed a "Bogg's rifle”*, if they were good marksmen, generally carried off the prize at shooting matches. *Bogg's rifle photo not available, click here to see a replica of an 1800's percussion rifle. click here and on the picture above. In the generation following Andy Boggs, Jr., was William Moore, the shoemaker of Webster Springs. He was better known as “Bill Moore.” His boots and shoes were prized just as highly as the sportsmen prized the Bogg's rifle. I doubt seriously if anyone really had the strength of this man. The following incident happened in the latter 1890 on Gauley River during the hunting season. Samuel F. Miller and Bill Moore went deer hunting at Turkey Creek and they had killed a deer which they brought down to the Gauley River (shown above). Bill loaded the deer, Mr. Miller and both guns on his back and waded across the river full of floating ice with perfect ease. Bill Moore was a man of remarkable strength and history can furnish fewer instances of greater strength and endurance than that of Boggs and Moore. It is also told of Andy Boggs that he could hold, in one hand, a mountain rifle with a 48” barrel and drive the center of a target at 60 paces, off hand. As a young boy, these stories were bigger than life and certainly Andrew Boggs was envisioned as a giant. I can still remember wondering if that poor mule ever got anything to eat while standing on the roof of that shed, waiting for his owner to come back with the money. Even in passing, Andrew Boggs left his mark in WV history. A large rock remains that Andrew "Andy" Boggs reportedly moved from the Lewis County side of the Little Kanawha River to his mill site in the late 1800s. Boggs was the first to be buried on top of a hill east of the millstone in the area now known as Boggs cemetery. Legend reveals that, during the Civil War, Andy, who was sympathetic with the Confederacy, hid from the Yankees on that hilltop. He is said to have remarked, "If one could hide from the Yankees there, surely it would be a good place to hide from the devil." To read more tales, click on the pot belly stove.